Pedal Pusher is an ongoing design research project that I am undertaking with my friend and colleague Magdalena Paluch. We are currently investigating design solutions that will get more women interested in bike commuting. As women are considered an “indicator species” for bike-friendly cities, our goal is to design wearable systems that can alleviate most women’s concerns of safety and comfort. We are taking a human-centered approach to designing solutions which will include numerous concept and material prototypes and ethnographic research. I plan on blogging about our findings and solutions as we move from one prototype to another. All that being said, our first prototype involves a wearable system that incorporates a stylish cycling shoe along with a custom pedal design. 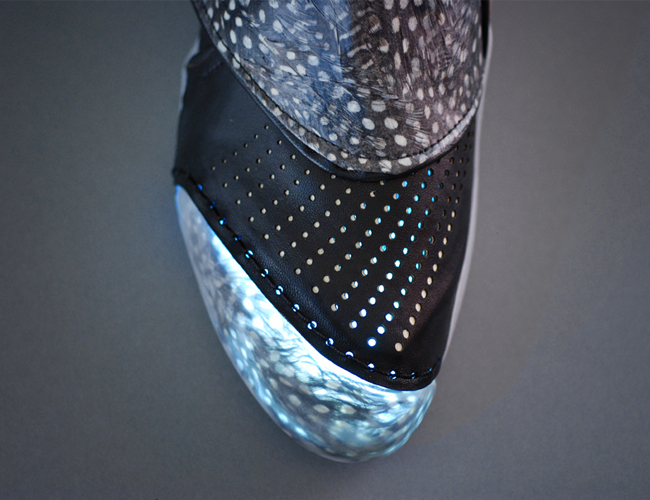 The shoe illuminates in the front and heel for increased visibility. 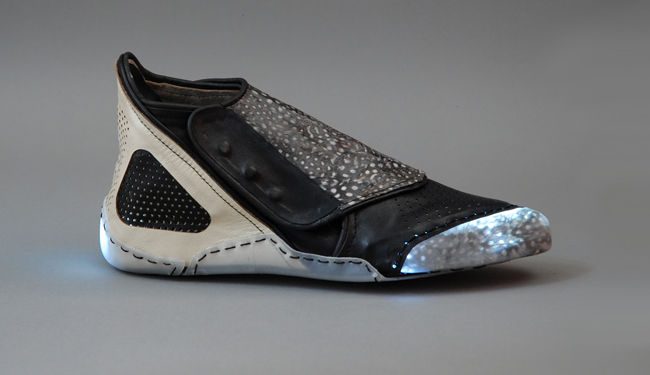 We are currently working on the custom pedal design which will use kinetic energy to power the shoe. As it was our first time designing a shoe, we focused our first round predominately on a formal and material study. We developed a beautiful new lightweight material made out of guinea feathers. In addition, we created stretchy and flexible electronic circuitry embedded in silicone that is waterproof and, in addition, diffuses the LED lights to a nice soft glow. I will write another post on the circuitry at a later date. 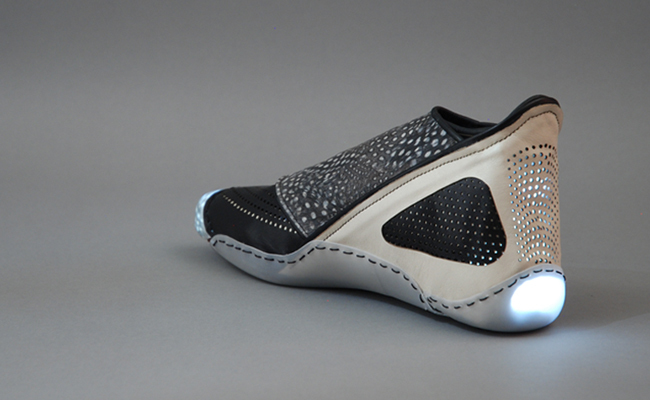 Future designs will incorporate a “smart” sole that will deal will the ergonomics of cycling to prevent injury. 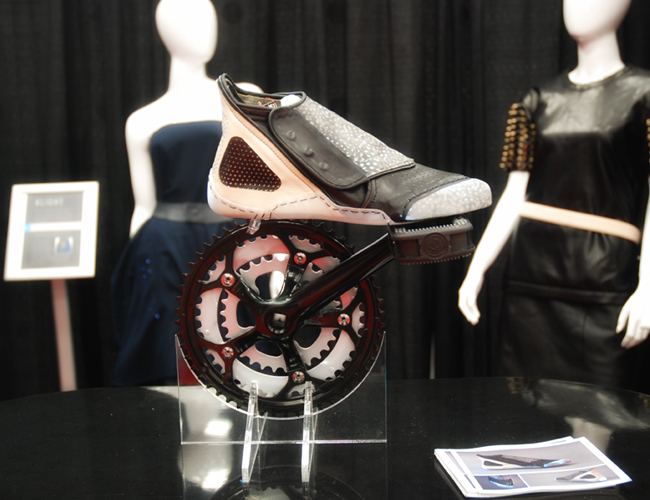 The Pedal Pusher made its debut at the StyleX. Austin is a huge cycling city and, to my delight, I received wonderful feedback! So stay tuned, as this project continues to evolve.